This 64-page full-color report also sets the foundation of buyside compensation programs moving forward and serves as an invaluable retention tool. Click here to download a free report preview. Click here if you are interested in purchasing this report. Options Group research reports and publications help our clients make better, data-driven decisions. We use a 360-degree approach to forecast hiring and compensation trends by combining data and insights from our candidates, our recruiters and our clients to create a comprehensive and concise roadmap of the human resources landscape. Get the 2018/2019 Buyside Report today. Get answers to why people accepted, rejected, or stayed at their current firms. Higher comp? Bigger roles? Different opportunities? Find out in the report! This 172 page report released in November 2017 contains over 1,200 compensation data points and over 50 placement examples across six major financial regions from associate to managing director levels. It provides in-depth analysis of hiring trends and the competitive landscape within key geographical regions, as well as compensation projections by asset class and product category. This 50+ page report provides results from our candidate survey conducted from September to October 2016 for professionals in FICC, equities, investment banking, electronic trading, information technology, quantitative research, risk management, asset management, hedge funds and private wealth management ranked by percentile. It provides statistics such as total compensation, expected percentage change in total compensation in 2016 from 2015, and sentiments on group performance. This 40 page report contains compensation data points for key roles such as portfolio managers, investor relations professionals, quantitative analysts, as well as risk and technology professionals across the US, EMEA and Asia. It provides in-depth analysis of emerging hiring trends, compensation structures and benchmarks by strategy and role for hedge funds, asset management firms, and private equity firms. This 150 page report released in November contains over 1,200 compensation data points and over 50 placement examples across six major financial regions from associate to managing director levels. It provides in-depth analysis of hiring trends and the competitive landscape within key geographical regions, as well as compensation projections by asset class and product category. OGiQ, the strategic solutions division of Options Group, polled thousands of financial services and technology professionals to assess base salaries for 2016, total compensation paid for 2015, expected change in headcount, and their attitudes towards compensation and firm turnover. This 50+ page report compares compensation levels for professionals at banks, buy side firms and technology companies. This 40+ page report contains compensation data points for key roles such as portfolio managers, investor relations professionals, quantitative analysts, as well as risk and technology professionals across the US, EMEA and Asia. It provides in-depth analysis of emerging hiring trends, compensation structures and benchmarks by strategy and role for hedge funds, asset management firms, and private equity firms. This 160+ page report released in December contains over 1,200 compensation data points and over 50 placement examples across six major financial regions from associate to managing director levels. It provides in-depth analysis of hiring trends and the competitive landscape within key geographical regions, as well as compensation projections by asset class and product category. Click on this link to view a brief 4-minute video about the composition and unique features of the Compensation Report. This 50+ page report provides results from our candidate survey conducted from August to October 2015 for professionals in FICC, equities, investment banking, electronic trading, information technology, quantitative research, risk management, asset management, hedge funds and private wealth management ranked by percentile. It provides statistics such as total compensation, expected percentage change in total compensation in 2015 from 2014, and sentiments on group performance. 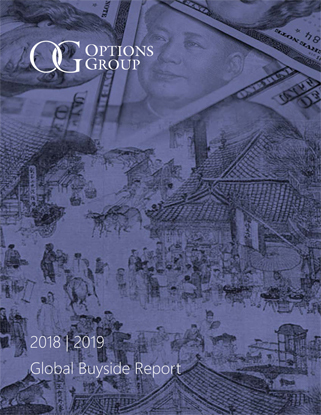 This 80-page report includes average change in 2015 total compensation (based on market conditions up to June 30, 2015) for professionals in FICC, equities, investment banking, electronic trading, information technology, quantitative research, risk management, and private wealth management in the US, EMEA, Asia, and Japan. It contains compensation tables comparing compensation levels by security and function across major firm types, counteroffer and rejected offer examples, key hiring and compensation trends, and select people moves. OG iQ, the strategic solutions division of Options Group, polled thousands of financial services and technology professionals to assess base salaries for 2015, total compensation paid for 2014, expected change in headcount, and their attitudes towards compensation and firm turnover. This 50-page report compares compensation levels for professionals at banks, buy side firms and technology companies.